NPS is considered ‘the ultimate question’ and an alternative to standard methods of customer satisfaction measurement. Moreover, it helps to link customer satisfaction with loyalty and revenue growth. Subsequently, it is still very popular even though it has attracted plenty of criticism, In fact, NPS has been widely adopted and as a result, more than two-thirds of Fortune 1000 companies now use the metric. For more on the NPS – check out the 15 top statistics here. According to the latest 2017 Temkin research, promoters are 4.2 times more likely to buy again. 5.6 times more likely to forgive a company after a mistake. 7.2 times more likely to try a new offering compared with the detractors. Adobe confirmed the finding: customer-centric businesses grew revenue 1.4 times faster and increased customer lifetime value 1.6x more than other companies. Based on their rating, customers are subsequently classified into 3 categories. Specifically, these are Detractors, Passives, and Promoters. ‘Detractors’ gave a score lower or equal to 6, so are not particularly thrilled by the product or the service. In addition, they are unlikely to purchase again from the company. Moreover could potentially damage the company’s reputation through negative word of mouth. We have highlighted some of the issues with this before. Passives’ gave a score of 7 or 8, so are somewhat satisfied but could easily switch to a competitor’s offering if given the opportunity. They probably wouldn’t spread any negative word-of-mouth. However, are not enthusiastic enough about the products or services to actually promote them. ‘Promoters’ answered 9 or 10 so they love the company’s products and services. They are the repeat buyers and enthusiastic evangelists who recommend the products and services to other potential buyers. 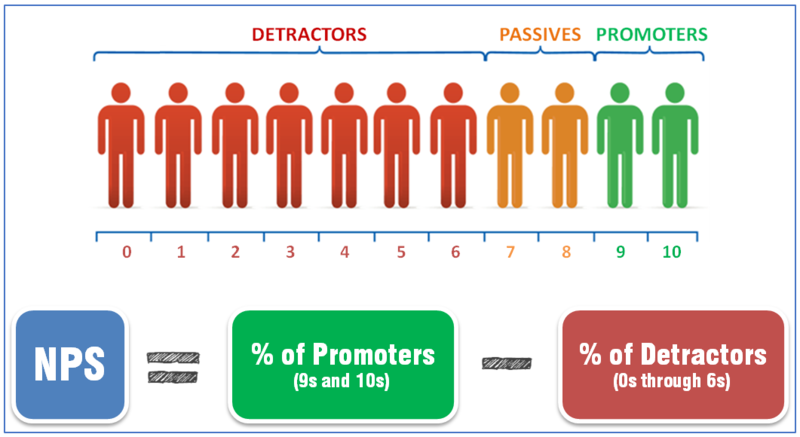 The Net Promoter Score (NPS) is determined by subtracting the percentage of customers who are detractors from the percentage who are promoters. This generates a result between 0 and 100 called the Net Promoter Score. At one end, if all of the customers gave a score lower or equal to 6, this would lead to an NPS of -100. 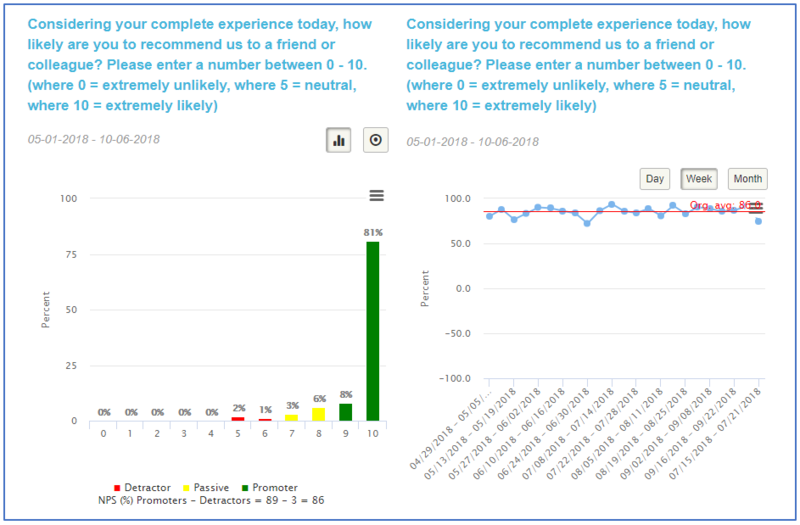 At the other end, if all of the customers were answering the question with a 9 or 10, then the Net Promoter Score would be 100. The dashboard shows the above within two charts. The first shows the distribution of each of the three groups, and the second is the time series for the location(s). The second chart automatically includes an organization average score (the red line). This means that the business can see if the location (s) scores above or below the organization.